The pre-history of automobiles is really pretty murky. As much as Mercedes-Benz likes to claim the invention of the motor car, the truth is much more complicated, with many different inventors adding parts to what eventually became the car. Most people would point to Nicholas-Joseph Cugnot's 1769/1771 artillery tractor as the first real self-propelled vehicle. 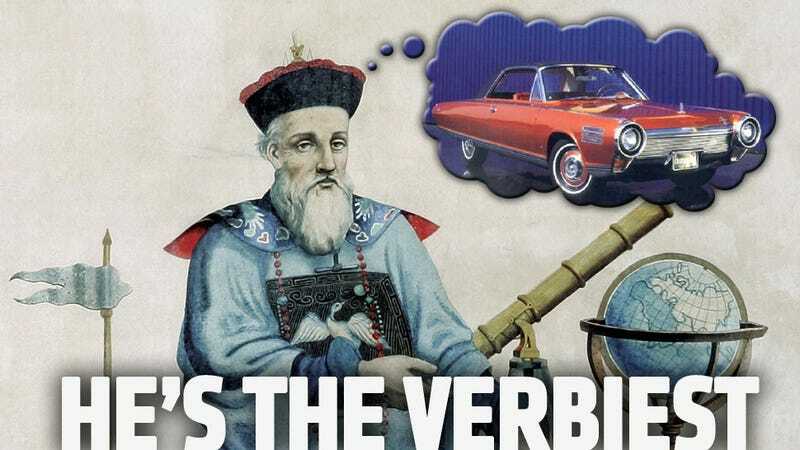 The truth, however, seems to be that nearly a century before that, a Jesuit missionary in China actually built the first self-propelled vehicle. Though, to be fair, it was a toy. That missionary was named Ferdinand Verbiest, and aside from having the verb-iest last name ever, Ferdinand was a very accomplished astronomer and scientist. He worked in the court of the Kangxi Emperor, a job he got by winning an astronomy contest against a Chinese astronomer. Winner got the job, loser was to be cut into pieces while still alive. Luckily for the loser, the sentence was commuted to exile, and Verbiest and the Emperor eventually became close friends, and I imagine would throw back some wine and laugh about the time the Emperor almost had old Ferdie diced. In addition to fixing calendars and designing astronomical instruments and cannon, Verbiest seems to have used his resources of some of the best fabricators in China (and likely the world) to build an interesting little diversion for the Emperor all the way back in 1672: a smallish (about 2 ft long) five-wheeled cart-like machine that had the then wildly-unique ability of self-motility. The cart used a very simple sort of steam turbine, a mild evolution of such other early steam turbines as Hero's aeliopile steam engine (I've speculated about its use in a car a while ago). The turbine in Verbiest's car was an open turbine, which is essentially a waterwheel for steam. A water-filled vessel with a nozzle pointing at the bladed wheel is heated over a small brazier, and the steam shoots from the nozzle to the wheel's vanes, causing it to rotate, and, in the case of a horizontal wheel, that rotational motion is translated 90° through a differential-like gear system, and then on to the wheels. This is a pretty crude, inefficient system, but there's no reason why it wouldn't have worked to propel a small, toy-like car. Verbiest describes it in his book, Astronomia Europea, and since the guy basically had the Orient's best metal shop at his disposal, I think it's pretty safe to assume the little car was actually built. If it was built, it would very likely be the first self-propelled machine ever constructed by man, and that's a big deal, even if it was a bit too small to sit in. Or even on, really. Verbiest's car is usually mentioned as a footnote or a sideline, but I don't really think that's fair. Even though the scale was small, the car had all the key components needed to qualify it as a motor vehicle: specifically, a motor and a vehicle. Plus, it wasn't a modification or retrofit of an existing wagon or carriage. This was designed to be a car from the beginning. I'm not exactly sure about the strange single fifth steering wheel setup, but it at least had something. Based on the car's purpose, I imagine the wheel could be set to allow the car to drive in circles of varying sizes. If scaled up, I have my doubts about how well it would perform, and the danger of the open blasts of scalding steam probably would make an unmodified scaling-up unadvisable. Still, a fairly simple modification involving enclosing the turbine wheel in a sheet metal enclosure would both help to direct and maximize the energy of the steam jet and protect riders and passers-by from brutal face-scaldings. I'm sure the Emperor found the car fascinating, and a big hit at Emperor-parties. Based on the circumstances of the car's use, the surrounding society, and the cheap and easy availability of horse-based horsepower available, it's not surprising the car remained just a novel toy. Now, if there had been a colossal horse-plague or some similar horse, donkey, and oxen genocide, there may have been reason to pursue Verbiest's toy, and we'd all now be lusting after the new 2014 Verbiest Firedragon, with quad steam-turbine power. I had a poster of a 1980s Verbiest Firedragon in my room as a kid!